Google Cloud Next ‘18 – Security, Performance, Innovation – Pick Cloud, Inc.
Last week, a few of us here at Pick Cloud attended Google Cloud Next ‘18. It was a hectic but very good few days that was filled with a lot of new announcements and information. Here are some of things we learned and how it can benefit MultiValue. First of all, a little bit about the conference. 25,000 people registered for the conference this year. This was a 2.5x increase from 10,000 in 2017 and over 12% increase from 2016 attendance. That in itself shows the power of Google, their cloud offering and how much people believe in it. What sets Google Cloud apart from other providers? Their data centers and security. Google prides itself on providing secure, efficient, high performing and innovative data centers. Each data center is fully redesigned every 18 months to increase performance and reduce costs. Google invests billions of dollars on an annual basis in infrastructure and have pioneered water cooling techniques that are unique to each region. This not only lowers costs, but is better for the environment. Google’s chips, servers, software, and private network are designed and controlled by them, end-to-end. No unnecessary peripherals like chipsets or video cards are allowed. These add additional vulnerabilities and costs. Their hardware operations team is available 24×7 to upgrade servers, manage the network and repair systems. You can rely on Google’s worldwide network and count on low latency and high responsiveness. Google has the world’s largest global private cloud network with 100+ points of presence, 17 regions and a hundred thousands of miles of fiber optic cable. Third parties estimate that upwards of one-third of the entire Internet traffic is going across Google’s networks on a daily basis. Google has eight products with over 1 billion users each. You can take advantage of the same infrastructure they use to serve billions of search queries every day in milliseconds, billions of hours of YouTube consumed daily as well as storage for over 1.4 billion active Gmail users. Google Cloud encrypts customer data stored at rest by default, with no additional action required from you. Data is also encrypted in transit. You can use your own keys or Google’s keys. Only Google employees with a data center related job are allowed to set foot on any data center campus. This means less than 1% of Google employees have ever been inside a Google data center. They have over 62,000 employees. You may be asking yourself, what does all of this mean to me? 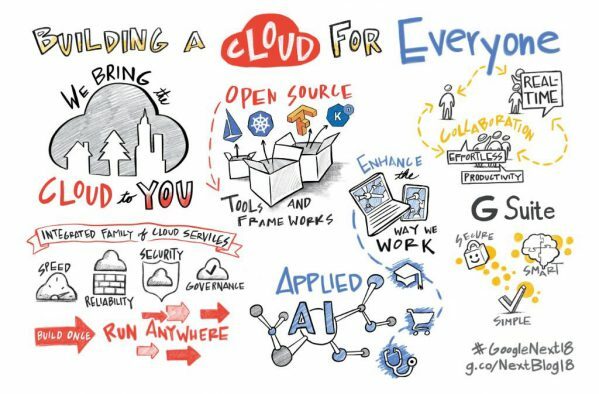 With Google’s constant investment in infrastructure, security and innovation, you can grow and scale your business without giving a second thought to capacity, reliability, or performance – and at a cost you can afford. Join the likes of Target, Ebay, Twitter and other Fortune 500 companies who take advantage of Google’s infrastructure to run their business. Lower costs, means you can add invest more money in your business and bottom line. You can rest easy knowing your data and systems are secure and not worry about your system going down. Google cloud is now up to 5 nines (99.999% uptime) which equates to 5.26 minutes of downtime in a year. Don’t take our word for it. See the power of Google Cloud firsthand, FREE for 15 days, no credit card or commitment required.